From the Baldwin County Courthouse, go east on Hancock St. and follow Highway 22 (Sparta Hwy) east for 2 miles. Turn left on Lake Laurel Rd. 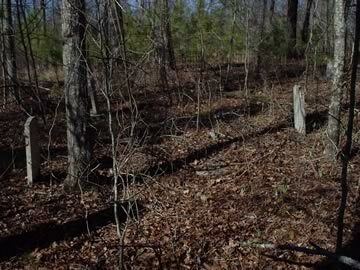 After 5.2 miles turn left on Gumm Cemetery Rd. Go 1.1 miles and cross the railroad tracks. Turn left on a private drive and walk 400 ft. The cemetery is on the left of the drive and is in a fence. Located on Baldwin Co. tax map #120-044. Blessed are the early dead. Our father has gone to a mansion of rest. To the glorious land by the Deity blest. Masonic emblem. A possible grave - a depression. "In memory of our father and mother, David & Mary Thomas" No dates. In memory of our father and mother, David & Mary Thomas. Blessed are the dead which die in the Lord. Rev. XIV, 13. Masonic emblem. w/o Dr. James Wallace Butts I. Age 109. b. Goochland Co., VA d. Midway, Baldwin Co. w/o James Thomas Grave not found in 2003. All info per TT. w/o David Thomas Grave not found in 2003. All info per TT. Grave not found in 2003. All info per TT.